Chilean Chupacabra watchers remain suspicious, and the case continues. In June of 2000, Chilean newspapers printed accusations from Chilean "UFOlogists" — people who study unidentified flying objects in the same northern deserts where Calama lies — of Chilean military officials finding three "Chupacabra eggs" and even catching the animal itself. The Chupacabra material was then turned over to NASA, according to Chilean press accounts. Radio programs in Chile have also accused the American space agency of creating the Chupacabra in a lab in the first place, while conducting genetic tests in the Chilean desert on mandrills, an animal similar to the baboon. NASA denies the charge with more annoyance than amusement. "Before this it was the face on Mars, and before that it was modifying the weather, before that we were beaming radiation from satellites to make people impotent," says a decidedly weary-sounding NASA spokesman, Brian Welch. "Before that they were saying we faked the moon landing." Welch suggests the Chupacabra is blamed on NASA because the space agency is the last place anyone in Chile would think to call and ask about it. "If you were persuaded to believe that sort of thing, you'd blame the last person you would go to for confirmation of it. I mean, people who believe this sort of thing certainly aren't beating down the door to ask us about it." Loren Coleman agrees and is comfortable with the wild dog explanation. "Dog packs tend to do that, go on frenzied attacks, eat a little, then leave the rest." The wounds in the Calama victims' necks were, indeed, far from surgical, he notes, and media accounts tend to stress the bizarre over simpler explanations. "Newspapers love the phrase Chupacabra, but most cryptozoologists aren't going to the bank with ." Meanwhile, a collective fascination with the beast means that any farm animal, pet cat, rabbit or chicken that comes to grief could be another Chupacabra case, simply because an animal dies and no one sees the predator. 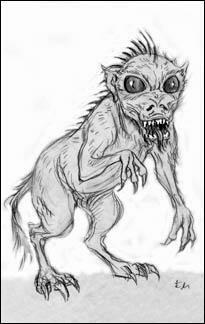 "If you look at the Jersey Devil," notes Coleman, citing an American myth strikingly similar to the Chupacabra, "anything unknown [that happens in New Jersey] falls under the heading the Jersey Devil. Exactly the same thing is happening now with the chupa." Perhaps. But then again, no one has found the wild dogs either. In Chile, to date, not everyone is convinced.